How did Olaf become Olaf? And how hard would it be for otherwise decent and honorable people to follow in his footsteps? The distinction between the Baudelaires and the mendacious villain pursuing them seems so obvious as to be unworthy of mentioning. Them: innocent orphans just trying to survive. Him: a thieving murderer who also acts. But while it’s easy enough to see which is which in “The Horrible Hospital, Part Two,” the lines are getting a little blurrier than maybe any of us should be comfortable with. In “Part One,” the Baudelaires stole from an innocent man. In “Part Two,” Klaus puts on a disguise, makes up a phony name, and even (gasp) tries out an accent. He does all of this in the name of saving his sister’s life, but it’s still a bit weird, isn’t it? "The Horrible Hospital, Part Two"
In truth, Hal’s complaints aside, it’s hard to blame Klaus, Violet, or Sunny for anything they’ve done so far to stay alive. 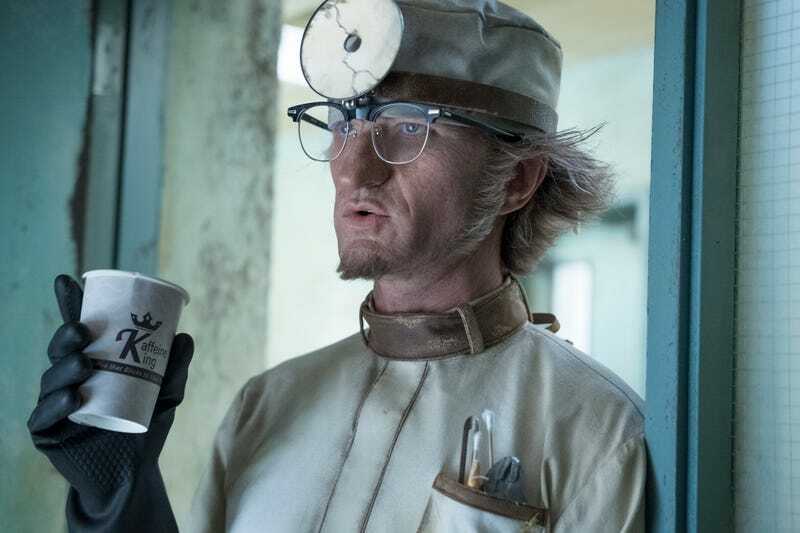 And yet the back half of A Series Of Unfortunate Events’ second season has started to slowly but surely introduce some moral ambiguity into the mix. Olaf is still a fiend—if anything, he’s even worse than usual—but our heroes are being pushed down a path towards uncertain ends. As their lives become more complicated, they are forced to take steps to protect themselves and the ones they love. Who knows where those steps could lead. Well, in this case anyway, they lead first into an operating theater, and then into a supply closet, before ultimately winding up in the trunk of Count Olaf’s car. Which isn’t a happy journey for anyone involved, but it is, god bless, a pretty exciting one. “Part Two” keeps up the much improved pacing of the previous episode. Violet’s capture immediately forces Klaus and Sunny onto the offensive, and the episode keeps the “kids tell the truth only for the adults to dismiss them” scenes to a minimum, saving it all for the climax and adding in a dash of culpability to make it that much more uncomfortable. The Volunteers Fighting Disease return and are even more annoying than they initially appeared, telling desperate hospital patients that cheerfulness and song are more important than good health care and water. Klaus dresses up as a doctor to try and trick them into giving him the patient list, only to be nearly stymied when Olaf himself makes an appearance. There’s some nice tension here too, as both Klaus and Olaf immediately see through each other’s disguises but can’t let on for fear of breaking their own cover. Klaus manages to get what he wants, and there’s some cute cleverness as he and Sunny (going off a clue from the Quagmire notes) do anagrams to find Violet’s location, but it doesn’t really matter. Olaf has planned everything from the start. Really, if there’s a fault here it’s that not a lot of this matters until Klaus winds up in the operating theater in his doctor disguise. Yet the scenes move fast enough that their inessential nature doesn’t really sting, not even Violet’s brief escape (and then almost immediate recapture) from Olaf’s clutches. At least the latter gives us a chance to give Babs more to do. She’s not the most dynamic character, but seeing her briefly flourish at the idea of donning a disguise makes it that much more of a relief when she survives the episode. It all comes to a head (ha ha) in that operating theater when Olaf tries to maneuver Klaus into performing a “cranioectomy” on his sister. There’s some great back and forth here, and the episode in general offers an excellent chance to see the Baudelaire kids actually getting a chance to do more than just be wonderful and suffer. Louise Hynes work as Klaus’s “Doctor Faustus” is particularly strong, and it’s gratifying how angry both Klaus and his sister are getting at Olaf’s antics. This helps to balance out the show’s increasingly creepy tone—the Baudelaires aren’t dupes, and their frustration with a world that appears designed to reward not just bad behavior, but patently idiotic bad behavior, isn’t difficult to relate to. In the end, as mentioned, the Baudelaires escape (thanks to Violet’s quick thinking, and Sunny’s ability to create a hair ribbon out of a hospital ID bracelet at short notice) while the hospital burns, and take the only choice left to them: tagging along with Olaf, not that he knows it. It’s a low point for our heroes (although don’t worry—things will get lower), but also one that’s thrilling in its unexpectedness. The series hasn’t dropped all of its signposts (Mr. Poe shows up for the big confrontation scene, and is just as useless as always), but it’s straying from them, step by step. Who knows where that might lead? As Esme complains to Olaf about the damn sugar bowl, we cut to a shot of the sugar bowl in a room in the hospital. As the fire rages, someone with red gloves picks the bowl up and spirits it away. Another Shining references as “Nurse Lucafont” breaks into the supply room. 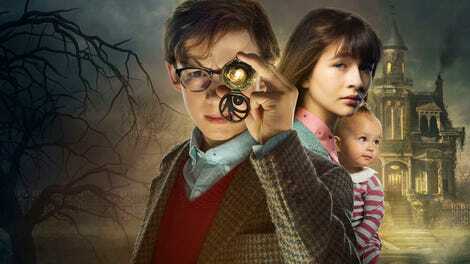 “I do not know where the Baudelaire children are now, if they are safe, or if they’re even alive.” -Lemony Snicket. Is this the first official confirmation that the story we’re watching will have an ambiguous ending? It may have come up in the first season, but I thought this was worth noting. I wouldn’t be surprised if Mr. Sirin, the man with butterflies in his stomach, shows up again in some capacity.